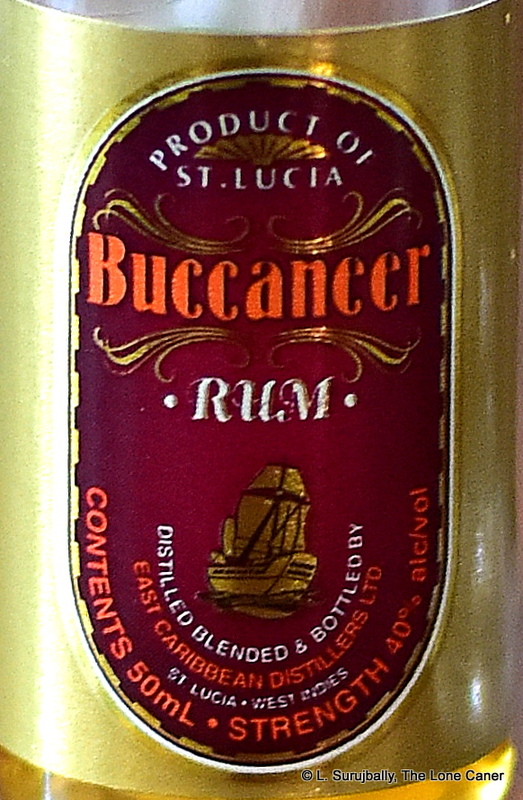 Ed Hamilton, in his 1995 book Rums of the Eastern Caribbean, made mention of the Buccaneer rum as a regular part of the St. Lucia Distillers lineup, but nowadays the rum is no longer in production – the last reference to it was an award given to it in the 2003 Rum Fest (which fest it was is somewhat open to conjecture), and a notation that it was discontinued, later confirmed by Mike Speakman that it was in the same year. So we can assume that the Buccaneer I tasted is at best an early 2000s rum, no later. An interesting point is that Hamilton wrote of it as being 43%, but both the label photo in his book and my sample came in at 40%. It’s likely that both variations existed, depending on the market in which it sold (i.e., US versus Europe) – DDL did the same with its El Dorados, for example. Nose – Honey, molasses, brine, olives, and the richness of ripe prunes, very arm and smooth. It’s a little sharp to begin with (it settles after five minutes or so), and has some interesting background aromas of gherkins, cucumbers, pears and a sort of salt-sour tang that’s difficult to pin down precisely but is by no means unpleasant. Palate – Oily, salty and sweet all at once. Tastes a little rougher than the nose suggested it might be, but is also quite warm after one adjusts. Pineapple, cherries, mangoes, followed on by dates, molasses, honey and brown sugar, and a touch of vanilla. Finish – Medium long, and here the molasses and burnt brown sugar notes really come into their own. Also some light fruitiness, aromatic tobacco and vanilla, but these are buried under the molasses, really. 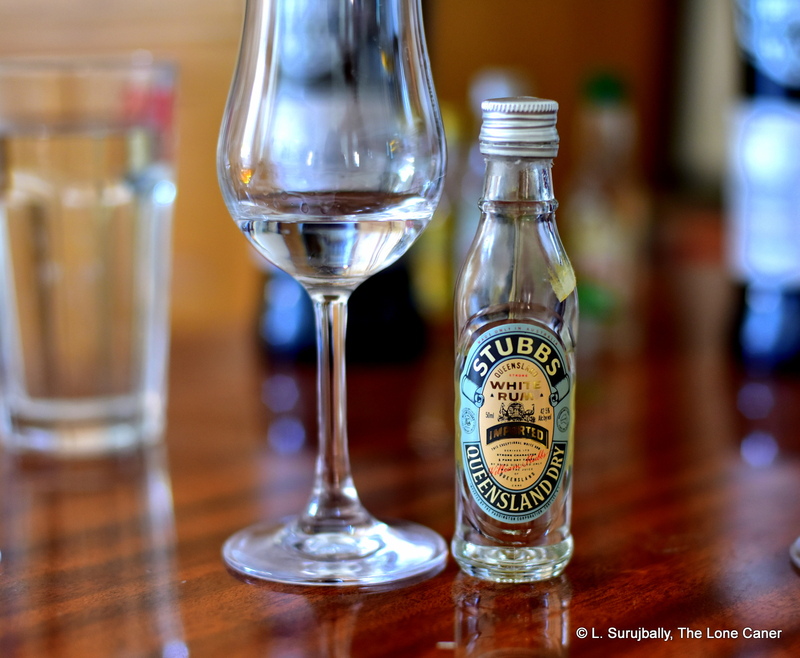 Thoughts – Certainly a rum from yesteryear. Nowadays the big guns from St. Lucia Distilleries are the 1931 series, the Admiral Rodney, the Chairman’s Reserve (and its offshoot the “Forgotten Casks”) and some of the cask strength offerings of the Independents (including Ed Hamilton himself). The writing had been on the wall for the wide variety and range of the distillery’s rums even back in the 1990s as they focused on core competencies, consolidation and better-selling brands. It’s kind of a shame, because this rum was quite a decent dram – but I like to think that all they learned in all the decades since they made them, has now been incorporated into the excellent series of standard proofed rums they make now. In that sense, the Buccaneer still lives on. Let’s move away from the full proofed rums released by indies and the major Caribbean companies, and switch over to something we don’t see very often, rums from the smaller islands — these traditionally sell well to the tourist trade and within their local markets, but don’t make much of a splash elsewhere. Some are considered undiscovered steals, and the internet is rife with throwaway comments on personal blogs and travel sites about some rum nobody ever heard about being the best they ever had. One of these is the golden 40% San Pablo rum out of the Dutch West Indies (also known as the Dutch Caribbean, Caribbean Netherlands or Netherlands Antilles – the name refers to the islands of Aruba, Curaçao, Saint Maarten, Bonaire, Sint Eustatius and Saba), which likes to call itself Curaçao’s favorite local tipple, a claim hardly likely to be disputed by any resident for patriotic reasons, or by any passing-through cruise-line tourist who might not know any better. Rum (or Ron) San Pablo is an odd name for a Dutch island product: all becomes clear when you understand it’s actually a rum originally made in Cuba. Like Bacardi, after being nationalized after the Cuban revolution, Justo Gonzalez brought his last aged stocks and the recipe to his importer on Curaçao and went into business with him to continue the brand (see a slightly more detailed history, below). The rum, then, is actually a transplanted Cuban product in the light Spanish style, and very likely column still produced (a factoid I had trouble confirming but it seems a reasonable assumption) – it continues to be made to this day — the exact distillery is something of a mystery — with distilled water, imported molasses from South America (no further info as to where precisely). It first got introduced to the US in 2005, and has more or less dropped out of sight since then. 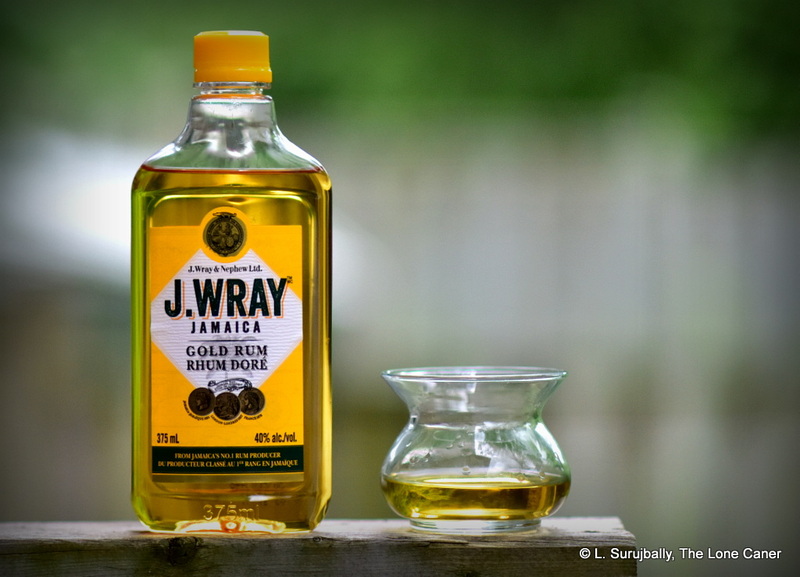 Sampling the rum says a lot for how far rum and consumers have come since those days. For its time it was undoubtedly the bees’ knees, and even as late as 2008 (around the time when it made a small ripple in the emerging blogosphere) people were complimenting its delicacy and smooth taste. But nosing the pale yellow 40% rum ten years down the road demonstrates its similarities to a low-rent Bacardi rather than establishing any kind of personal individuality or pedigree. It is very delicate, very light, with soft aromas of molasses, cane sap, citrus, caramel and vanilla. It has a nice little woodsy note to it, sawdust maybe, and also a light line of tobacco which segues in and out without ever becoming dominant. Because of its living room strength and light style of production, it is very difficult to come to grips with it on the palate, especially when compared to the falling sea-cans of oomph represented by full proof island rums — against those the San Pablo is almost like a wispy lace handkerchief versus a purse made from a crocodile’s back. The delicacy and faintness of the profile is at fault here: one can sense honey, cucumbers, citronella, sugar water, aromatic tobacco and cloves, but that’s me after serious concentration in a controlled environment with an hour to spend on the exercise, and who’s got time for that when ordering a rum in a bar somewhere? The finish is just more of the same – light, sweet, warm, soft, mostly vanilla and honey and some sweet breakfast spices, with just a hint of molasses and a sliver of lemon zest, and then it’s gone in a flash. A rum like this should, I suppose, be taken for what it is – a delicate, quiet drink meant to be chucked into a minibar or a cocktail with equal facility. I think it’s a rum initially made for Americans in a pre-”Real-Rum” era when all that the local producers in the Caribbean were hoping for was to copy Bacardi, or to make their own hooch to dump into an exotic fruity free-for-all so it could have some kick. On that level I suppose it succeeds. 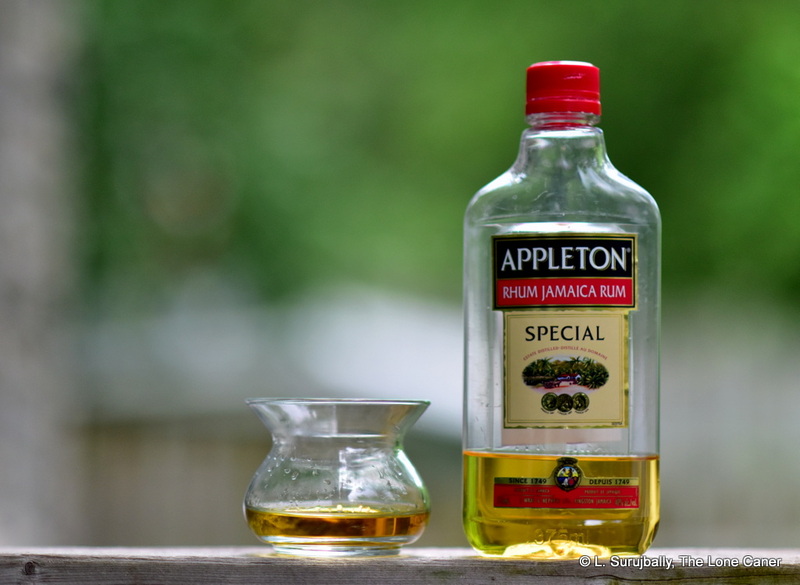 On any other level, it’s a rum to take note of simply because few of us have tried it, and, at the end, I consider it a pretty undistinguished product that makes no waves outside its island of origin, and doesn’t seem to want to. The company lore states that a local Curaçao importer, August Damian Jonckheer, began bringing in the San Pablo brand as far back as 1945: no search I was able to construct allowed me to trace the San Pablo brand before that, even though all websites I trolled through are clear that Señor Justo Gonzales was making this rum for many years before that. Although Gonzalez — like many of the Cuban distilling families — played both ends against the middle in the 1950s by supporting both Batista (in order to keep operating) and Castro (just in case), once the Cuban Revolution was a done deal Castro nationalized all the distilleries – the Bacardi saga is probably the best known. The story goes that after Gonzales importuned Castro not to take over San Pablo, recounting his many donations to the cause, Fidel wrote him a cheque for that very amount on the spot and went ahead anyway. Gonzalez cut a fast deal with A.D.Jonckheer to buy the 150 barrels of rum he had ageing in Cuba (but that immediate payment should be withheld), fled the island with his recipe, and went into partnership with Handelmaatschappij (AD’s company), and formed the Aruba Distilling Company, with a bottling facility on Curaçao. In the 1970s Gonzales sold his share of the ADC to Jonckheer, a situation that continues to this day with A.D.’s descendants, and with the original recipe intact. It is unknown which distillery currently makes the rum – it was suggested that an outfit on Bonaire does. Also unknown is where the molasses originates, and how long it has been aged. I’ve sent a message to Curacao to see if I can get some answers, and will update this post with any additional information as or if it becomes available. Few are unaware of the existence of the J. Bally 1929 – for those who troll the online shops it remains one of the few very old bottlings from inter-war Gilded Age times to remain available…if one has over two grand kicking about to buy it.The Bally 1924, on the other hand, is a whole lot rarer – I can’t remember the last time I saw one coming up for discussion, let alone sale. And one could argue that its heritage is much more gold-plated – it’s the first vintage from J. Bally. I’ve tried quite a few from this bottler, one dating back to the 1960s, but to try the very first? That might be worth a kidney right there. This bottle being such a piece of heritage, a little history is in order. J. Bally was named after Jacques Bally, a graduate of a top engineering school in Paris, the Ecole Centrale des Arts et Manufactures (ECP, founded in 1829) – he snapped up the Lajus Plantation on Martinique in 1917, a mere fifteen years after Mount Pelee erupted, when memories of that disaster were still fresh and land prices were cheap (Lajus, founded in 1670, was already in foreclosure, having gone bankrupt after the 1902 disaster). By 1920 he had installed new steam engine, fixed up the salvageable equipment he could and (legend has it) pretty much built his own column still from scratch. In that same year the nearby Habitation Dariste owned by the the Gronier family went bankrupt and Bally bought it in 1923 and moved the distillery equipment to Lajus to augment his own machniery. In 1930, by which time he was already laying away rum stocks to age, he also had a hand in designing the signature pyramidical and square bottles which became so associated with Bally in later years. The rhums Bally made were very popular, sold well, and the company remained in business until the 1980s when Remy Cointreau acquired it, at which point production was shut down at Lajus and moved to Domaine du Simon where (as far as I know), it’s still being made, with cane from Lajus. Note that in 2003 La Martiniquaise bought out Saint James and Bally (to add to their rum portfolio which already contained the brands of Depaz, Dillon, Negrita and Old Nick) which is why the Remy Cointreau’s webpage makes no mention of either one now. 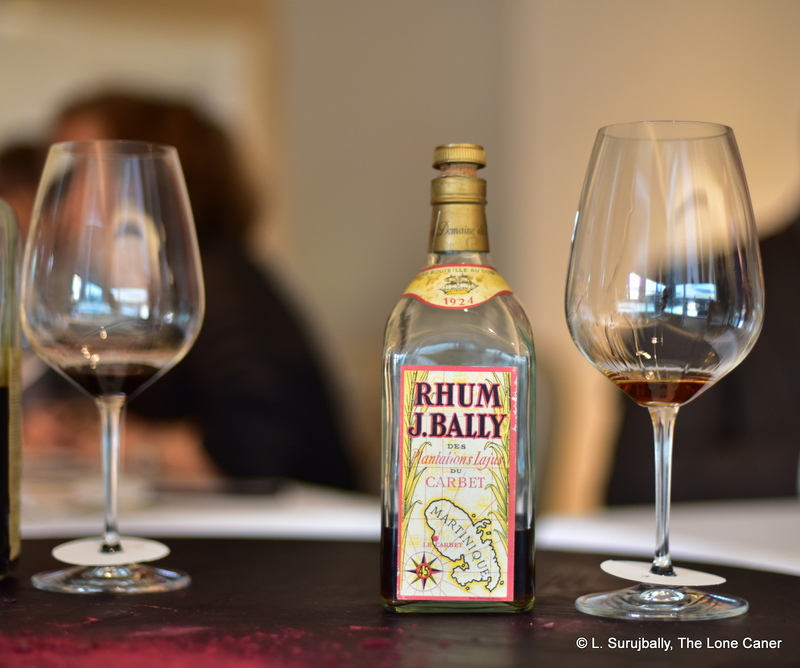 Aside from being made so long ago, what makes the 1924 special is that it was the initial release of an aged rhum from Bally, and one of the first of its kind in the French West Indies, if not the first. Jacques Bally took inspiration from cognac and eau-de-vie makers in France and was apparently the first to consider ageing Martinique rhums in oak. This provided the initial release of his rums in the 1920s with a depth of quality that made them extremely popular and well-known, and one can just imagine all the other distilleries on the island rushing to copy the idea. The inevitable question arises, how old is the 1924 vintage? “More than six years,” said Luca in a text to me, and that makes sense if the bottle that houses it was only designed and made in 1930. We can leave it there with only one other great unknown, and that’s how many bottles were released – and nobody knows that any longer, sorry. I hit a brick wall on that one. Enough of the pedantic stuff. How was it to taste, eliminating all the baggage of history and heritage and rarity the rhum came with? It’s one thing to sing high praises because it’s from so far back, but a cold review is somewhat more challenging, especially considering the august company in which I tried it – the Tasting of the Century in September 2018. You can bet that I was paying real close attention and took a long time with my glass on this one, if only so I wouldn’t be embarrassed when real writers came out with their own notes. Nose first: nice! For all its age, the Bally 1924 could have come off the line last year and you’d never know it. It smelled of fresh squeezed apple juice, pears with oodles of sweet light aromas, flowers, sugar water and watermelon, out of which emerged a nice melange of crushed walnuts, fanta, lemon zest, crisp yellow mangoes and cumin. If you were tasting it blind you’d swear this was an agricole you could pick up online for some reasonable coin – like the Harewood 1780, it presented a profile not a hundred miles removed from something produced today. Bottled at 45% ABV, the Bally 1924, for all the noble pedigree granted by being made so far back, in many ways resembled Bally rhums from past decades’ that I went through three years ago. It was slightly sharp on the palate, and as clean and clear as any of its descendants. Apples, cider, brine and olives came smoothly off the assembly line, bolted on to emergent flavours of pears in syrup, green grapes, spices, more lemon zest, leather, a touch of vanilla and nougat and a vague hint of grass, black tea, earthy musk, and rosemary. The overall balance, cleanliness of the mouthfeel was excellent, and the ageing had definitely sanded down any rough edges – it was quite simply a pleasant drink to have, fading easily into a smooth finish that provided little that was new, just a languorous recap of the highlights – peaches, pears, mangoes, lemon zest, watermelon and sweet flowers and herbs and a pinch of cumin. A neat and near-perfect little agricole, coming together beautifully. Well. How to score something like this? Well, I’m going to give it a solid endorsement — not that this means anything given its mythical near-unicorn status. But I should note in passing that for all its quality, the Bally 1924 strikes me more as an essay in the craft of agricole than a completely finished product that stands the test of time. It shows what they were before the snapped into focus in the last few decades of the AOC regs. Perhaps it’s unfair to rate a rhum made nearly a hundred years ago to the standard of today when so much has changed in the interim — and for sure others around the table that day loved it (Matt rated it as his personal favourite for the evening). To round things up: the Harewood 1780 presented a startlingly modern profile that went in its own brilliant direction way, strong, forceful, distinct; the Skeldon 1978 couldn’t rise above its elder brother but was still quite an amazing drink; and the Saint James 1885 was a rum made in a style quite different from agricoles as a whole, unique and interesting. The Bally is caught in a limbo between the modern versions of the spirit, and the old ways of the 1885 – that’s in no way a failure, just that the competition is more fierce because we’ve had so many rums that are so similar to it. But you know, whatever the score, there’s a certain cachet, even honour, in having been able to try a quartet of such grail-quest rums, so old, so rare, so absolutely stinking of rum history, so generously shared. The Tasting of the Century might one day be exceeded (though I can’t for the life of me imagine what rums would comprise version 2.0); but whether that happens or not, I’ll always be happy to have tried the Bally — because it was one of those rhums that pointed the way to the modern era of cane juice rhums, so exactingly made, so proudly issued, so excellent to drink. The Saint James 1885 might be the doddering grandaddy of the French island rhum style, but the 1924 with its crisp and clear profile taking us back to the beginning of the modern era, is surely its godfather. 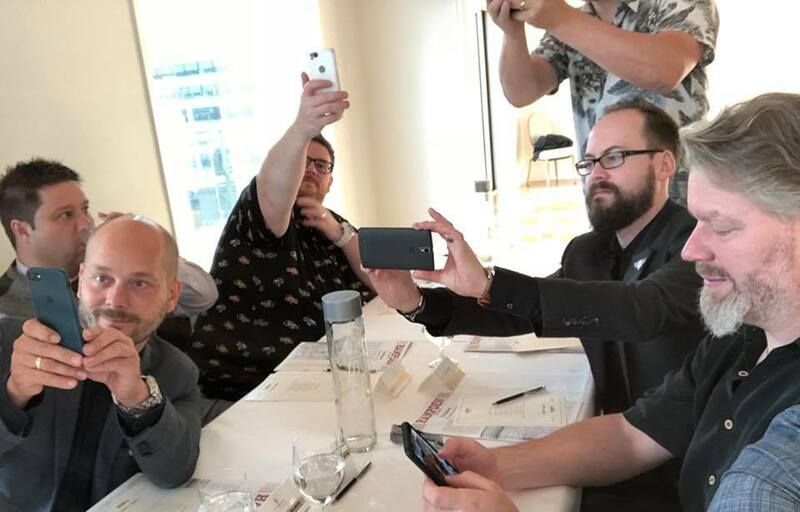 By now just about anyone in touch with the rum blogosphere on social media is aware of the add-on to the Hampden Rums launch hosted by La Maison-Velier in September 2018: the “Rum Tasting of the Century” — though I believe the words “…so far” were were silently tacked on by some of us participants, hoping against hope for another (better, older) one before we get laid to rest like Nelson in a cask of DOK. Nor are many unaware of the four aged unicorn rums we were privileged to try as part of the Tasting – Skeldon 1978, Bally 1924, Harewood House 1780, and the subject of this revisit, the Rhum des Plantations St. James 1885. I’d had the luck and good fortune to sample the St. James before and have written about it as part of the Rumaniacs. This of course cut me absolutely zero slack with the attending Collective – because for all our camaraderie and friendship (online and off), we’re a cheerfully competitive bunch of people, and like to get our personal opinions settled (no others being as good as our own, naturally) before even acknowledging that someone else may have tried a particular rum in front of us. Still, we had to get facts, and a lot of our preliminary conversations and subsequent texts and messages revolved around the data points, which are as follows: the rhum was made in 1885 on Martinique, and derived from cane juice that was boiled prior to fermentation. Although the exact age is unknown, it was certainly shipped off the island before Mount Pelée erupted in 1902 and destroyed all stocks there, so at an absolute maximum it can be 17 years old. This is, however unlikely – few rums or rhums were aged that long back then, and the opinion of the master blender of St James (Mark Sassier) that it was 8-10 years old is probably the best one (Cyril of DuRhum has some additional details in his 2016 review) . 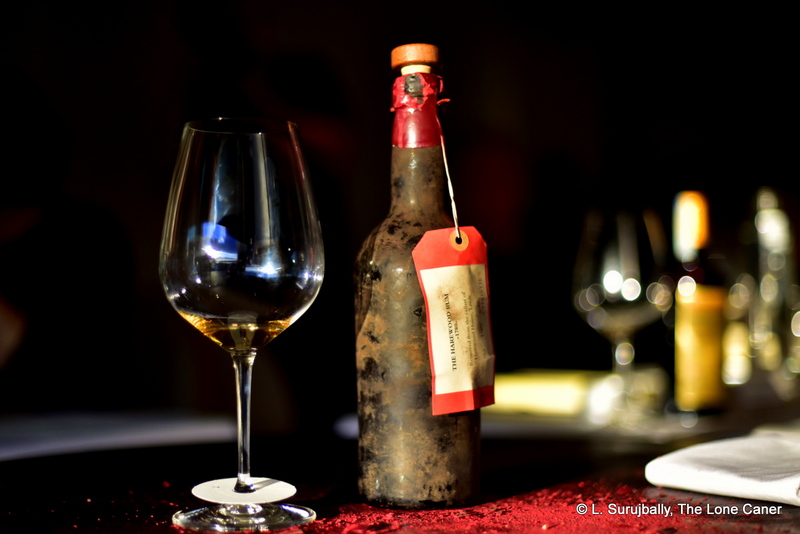 Following the eruption of the volcano, the only remaining bottles were in Europe and gradually unsold ones were acquired (many from the cellars of Bardinet) and sent back to Martinique and put on sale. Luca, who was a brand ambassador for St. James at one time, eventually acquired (or so legend goes) about 300 bottles in the 1980s. One of them, 47% ABV as tested in 1991, stood before us in a conference room in the Four Seasons in London overlooking theThames, awaiting our attention. 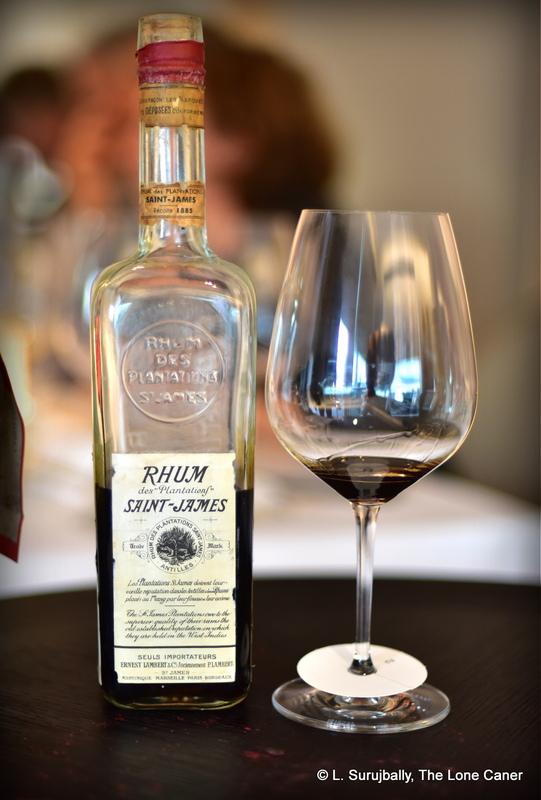 The first thing everyone remarked on about this rhum was the colour – a dark dark dark mud brown. The second thing was the aroma. 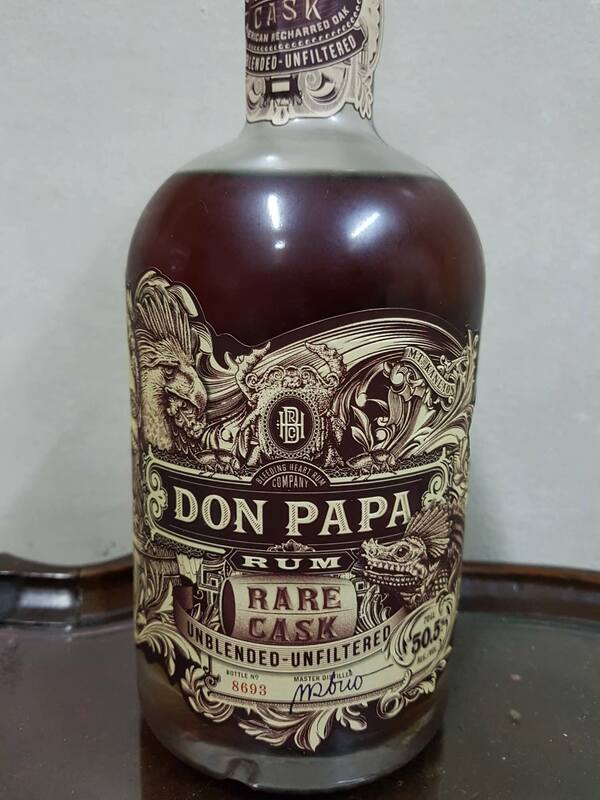 Without doubt this remained one of the richest rum smells of my own experience: it was redolent of coffee, licorice, coca-cola, bitter chocolate, coconut shavings accompanied by enormous notes of molasses. There were, after some additional minutes, some light fruits and florals and lemon peel, but overall, it reminded one of nothing so much as a Demerara rum, not an agricole, and a really heavy, thick Demerara at that. Though my tasting memories of the first 1885 rum I had tried three years earlier had faded somewhat, I still remembered much of the core profile, and these were back for an encore, with the same dull richness that made it so memorable back then. Bitter chocolate, nougat, nuts, grated coconut and coffee led off the charge, with flanking movements of licorice, caramel, coke and the noticeable leather and oak tannins that spoke to some ageing. Fruits again – pears, orange zest, plums, blackberries. The texture on the tongue was heavy, stopping just short of cloying, and I must remark on the fact that it was overtaken a little too much by the forceful molasses tastes. Still, it was a great sip, and the rum glided smoothly to the finish with last notes of earthy mustiness, roasted chestnuts, molasses (of course), fast-fading fruitiness, dates and chocolate. What a difference a mere three years makes. 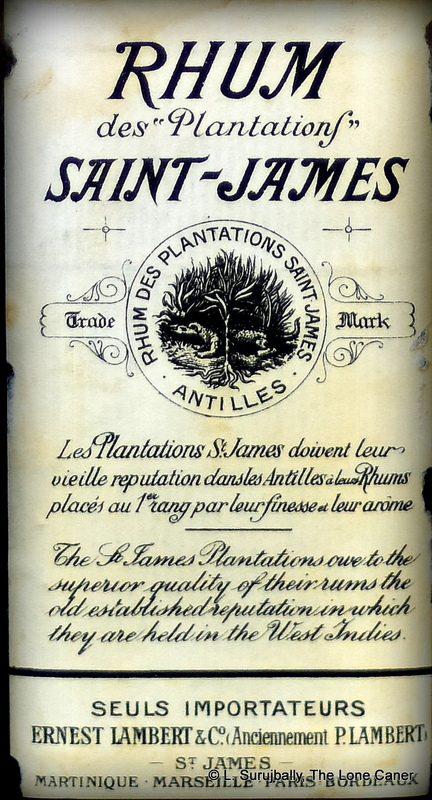 In 2015 my sample of the Saint James 1885 got rated 90, and I commented favourably on its depth and complexity. Certainly, compared to the rhums against which it was being tried that day (Barbancourt 25 YO and 15 YO, La Martiniquaise Rhum Pur, La Favorite 1990, and J. Bally 6 YO) and my own experience with uber-old spirits to that point, it was a score I have no problems defending. However, since then I’ve tasted and gone into depth with and written about another 300+ rums, and quite aside from wry commentaries about not having a life, it’s clear that both increased experience and different comparators do make a difference in assessing the same rum years later. On that basis, I’m going to rank it a few points lower this time, but in truth, the score is meaningless for a rhum this rare and that expensive and from so far back. I think that for anyone who has opportunity to try a rum made over a hundred years ago, it’s enough to simply say that they drank it. It’s a window into perceiving French island’s rhum before agricoles became agricoles, before the AOC, before the production methodologies of today. It promotes understanding of how rum has developed and changed over the decades and centuries, and if one is left with a single thought after the fact, it’s that it was and remains an experience to rival few others in our long journey of rum appreciation. That alone might be worth all the points anyone could ever give it. All the Rumaniacs’ members reviews can be found here. Although the Ministry of Rum speaks to Stubb’s as being made from molasses, the label of the bottle itself says it’s made from cane juice, and I think I’ll go with that. And in spite of the retro-style design of the label, it seems that it was created from scratch in the 1990s with a view to capturing some export market share from Bacardi, and after being introduced to the market, fell flat and was discontinued. And while both Peter’s Rum Labels and the Ministry make reference to the fact that Beenleigh Distillery is the holder of the brand, Beenleigh’s own website makes no such assertion, and there are trademark records of a 1990s company called William Stubbs & Company (which is now dead) bearing a very similar logo to the one shown here. So we can therefore say with some assurance that the rum was Australian, released in the 1990s, column still, meant for export, and is now defunct. 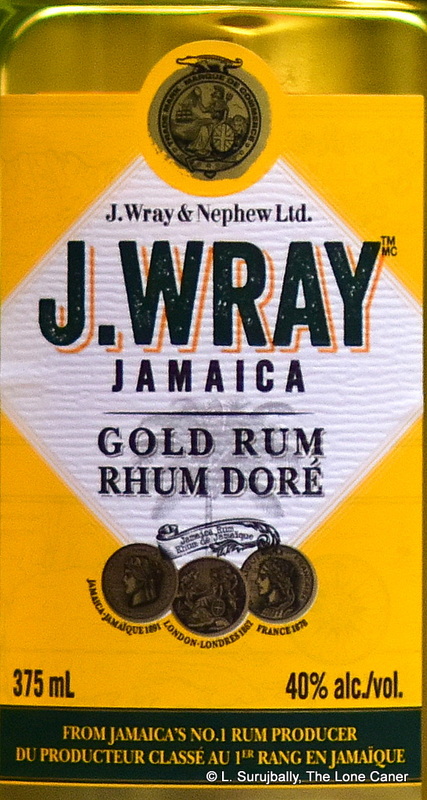 That’s more than we usually have, for a rum this obscure, so huge thanks to Steve and the others who chipped in. Nose – Quite sharp, with light fruit and estery aromas immediately evident. Some cucumbers in vinegar, dill, grass and watery pears, together with sugar water. The profile does indeed point to a sugar cane juice-based rum rather than one of molasses. Palate – Watery and sweet, oily almost, with a touch of brine and light olives. Not a whole lot going on here – sugar cane sap, a hint of musky maple syrup, vegetals, dill. It feels a little unrefined and rough around the edges, and not so different in profile as to suggest something off the reservation (the way, for example, Bundie is always at pains to demonstrate). Finish – Relatively long and aromatic, floral, with sugar water and tinned pears in syrup, plus a pinch of salt. Thoughts – Unspectacular, probably filtered rather than issued straight off the still. Its misfortune was to be released at a higher than usual price just as an economic slump hit Australia, and sales dipped, causing it to be discontinued before the new millenium dawned. Nobody seems to miss it much. Given my despite and disdain for the overhyped, oversold and over-sugared spiced-alcoholic waters that were the Phillipine Don Papa 7YO and 10YO, you’d be within your rights to ask if I either had a screw loose or was a glutton for punishment, for going ahead and trying this one. Maybe both, I’d answer, but come on, gotta give each rum a break on its own merits, right? If we only write about stuff we like or know is good, then we’re not pushing the boundaries of discovery very much now, are we? All this sounds nice, but part of the matter is more prosaic — I had the sample utterly blind. Didn’t know what it was. John Go, my cheerfully devious friend from the Phillipines sent me a bunch of unlabelled samples and simply said “Go taste ‘em,” without so much as informing me what any of them where (we indulge ourselves in such infantile pursuits from time to time). And so I tasted it, rated it, scored it, and was not entirely disappointed with it. It was not an over sugared mess, and it did not feel like it was spiced up to the rafters — though I could not test it, so you’ll have to take that into account when assessing whether these notes can be relied upon or not. That said, let’s see what we are told officially. Bleeding Heart Rum company issued 6000 bottles of the Rare Cask in 2017 at 50.5% ABV – which is immediately proved to be a problem (dare I say “lie”?) because this is bottle #8693 – and just about all online stores and online spirits articles speak to how the rum has no filtration and no “assembly”…well, okay. One site (and the label) called it unblended, which of course is nonsense given the outturn. Almost all mention the “STR” – shaved, toasted and roasted – barrels used, which we can infer to mean charred. There’s no age statement to be found. And there’s no mention of additives of any kind, the stuff which so sullied the impressions of the 7 and 10 year old: and although I have been told it’s clean, that was something I was unable to test for myself and wouldn’t trust if it came from them (see opinion below). You can decide for yourself whether that kind of outturn and information provision qualifies the tag of “Rare Cask.” It doesn’t for me. With all that behind us, what’s it like? Well, even with the amber colour, it noses very lightly…it’s almost relaxing (not really normal for 50% ABV). Somewhat sharp, not too much, smells of sweet tinned peaches in syrup, with spices like nutmeg and cinnamon being noticeable, plus floral notes, vague salt crackers, bitter chocolate, vanilla and oatmeal cookies. My notes speak of how delicate it noses, but at least the thick cloying blanket of an over-sweetened liqueur does not seem to be part of the program. In its own way it’s actually quite precise and not some vague mishmash of aromas that just flow together randomly. The taste is different – here it reminds one of the El Dorado 12 (not the 15, that’s a reach) – with a strong toffee, vanilla, brown sugar and molasses backbone. Lots of fruitiness here – raisins and orange peel, more of those tinned peaches – and also ginger, cinnamon, and bitter chocolate together with strong black tea. These latter tastes balance off the muskiness of the molasses and vanilla, and even if it has been sugared up (and I suspect that if it has, it is less compared to the others in the line), that part seems to be more restrained, to the point where it doesn’t utterly detract or seriously annoy. The finish is surprisingly short for a rum at 50%, and sharper, mostly brown sugar, fruit syrup, caramel and chocolate, nothing new here. So all in all, somewhat of a step up from the 7 and the 10. Additives are always a contentious subject, and I understand why some makers prefer to go down that road (while not condoning it) — what I want and advocate for is complete disclosure, which is (again) not the case with the Rare Cask. Here Bleeding Heart seem to have dispensed with the shovel and used a smaller spoon, which suggests they’re paying some attention to trends in the rum world. When somebody with a hydrometer gets around to testing this thing, I hope to know for certain whether it’s adulterated or not, but in the meantime I’m really glad I didn’t know what I was trying. That allowed me to be unbiased by the other two rums in the dustbin of my tasting memories when doing my evaluation, and I think this is a light-to-medium, mid-tier rum, probably five years old or less, not too complex, not too simple, with a dash of something foreign in there, but a reasonably good drink all round — especially when compared to its siblings. 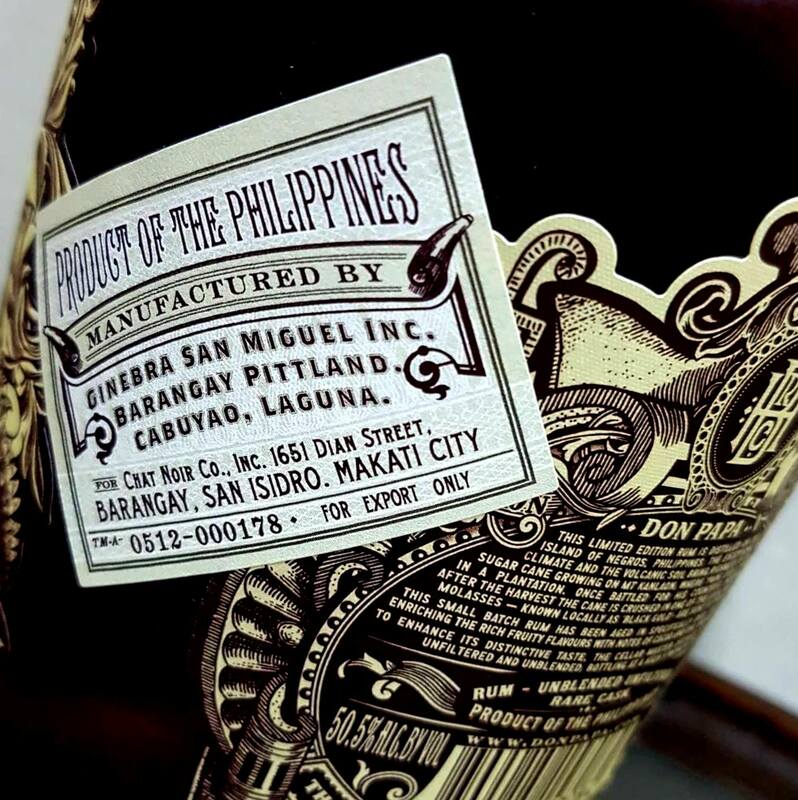 According to the bottle label, the distillery of origin is the Ginebra San Miguel, founded in 1834 when Casa Róxas founded the Ayala Distillery (the first in the Philippines). Known primarily for gin, it also produced other spirits like anisette, cognac, rum and whisky, some locally, some under license. The distillery was located in Quiapo, Manila and was a major component of Ayala y Compañia (successor of Casa Róxas), which was in turn acquired by La Tondeña in 1924. That company was established in 1902 by Carlos Palanca, Sr. in Tondo, Manila and incorporated as La Tondeña Inc. in 1929. Its main claim to fame prior to its expansion was the production of alcohol derived from molasses, instead of the commonly used nipa palm which it rapidly displaced. Bleeding Heart is associated with the company only insofar as they evidently buy rum stock from then, though at what stage in the production or ageing process is unknown. One of the key concepts coiling around the various debates about additives is the matter of trust. “I don’t trust [insert brand name here] further than I can throw ‘em,” is a constant refrain and it usually pops up when adulteration is noted, suspected, proved or inferred. But the underlying fact is that we do trust the producers. We trust them all the time, perhaps not with marketing copy, the hysterical advertising, the press releases, the glowing brand ambassadors’ endorsements, true – but with what’s on the bottle itself. The information on the label may be the most sacred part of any rum’s background. Consciously or not, we take much of what it says as gospel: specifically the country of origin, the distillery source, the age, whether it is a blend or not, and the strength (against which all hydrometer tests are rated). Gradually more and more information is being added – tropical versus continental ageing, the barrel number, angel’s share, production notes, and so on. We trust that, and when it’s clear there is deception and outright untruth going on (quite aside from carelessness or stupidity, which can happen as well), when that compact between producer and consumer is broken, it’s well-nigh impossible to get it back — as any amount of Panamanian rum brands, Flor de Cana (and their numbers) or Dictador “Best of…” series can attest (both the Best of 1977 and the Mombacho 19 review had commentaries on trust, and for similar reasons). 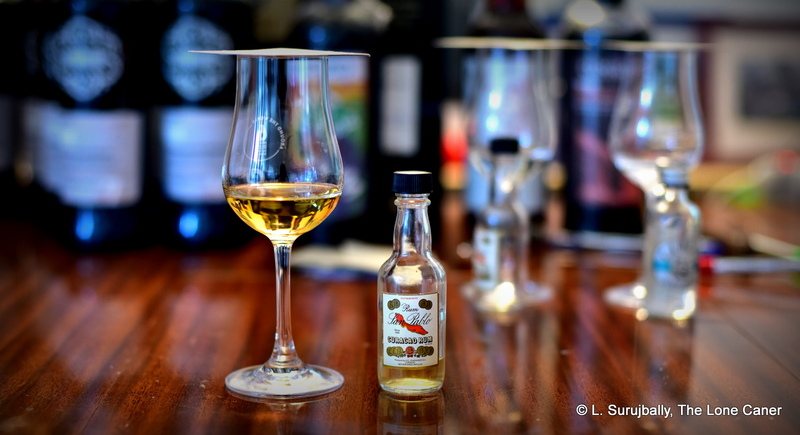 Also, for example, not all companies who claim their rums are soleras have been shown to really make them that way (often they are blends); and aside from spiced and flavoured rums (and Plantation) just about no producer admits to dosing or additives…so when it’s discovered, social media lights up like the Fourth of July. This is why what Bleeding Heart is doing is so annoying (I won’t say shocking, since it’s not as if they had that much trust of mine to begin with). First, no age statement. Second, the touted outturn given the lie by the bottle number. Third, the silence on additives. Well, they could have been simply careless, labelled badly, gave the wrong info the the PR boys in the basement; but carelessness or deception, what this means is that nothing they say now can be taken at face value, it’s like a wave of disbelief that washes over every and all their public statements about their rums. And so while I give the rum the score I do, I’d also advise any potential buyer to be very careful in understanding what it is that we’re being told the rum is, versus what it actually might be.